Synthetic baby soaps and body washes may look harmless, but are full of toxic synthetic chemicals and are not good for a baby’s tender, sensitive skin. Repeated use of a synthetic bodywash or baby soap dries out baby’s skin, alters its pH and leaves baby’s immune system vulnerable. 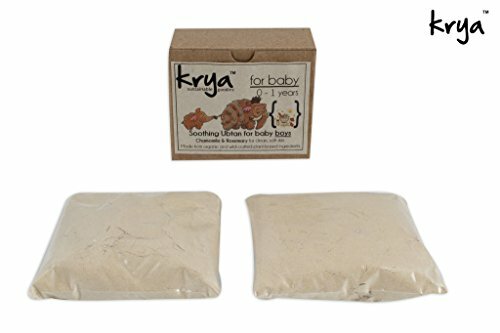 The Krya Ubtan for baby boys is an Ayurveda inspired, gentle, ALL NATURAL, alternative to soap for baby boys. The product is formulated using only organically grown lentils and grains like Heritage Mung Bean, Heritage varieties of rice like Mapillai Samba, and carefully selected forest collected herbs like Vilwa, Mulethi , Tree Turmeric and a special set of shade-dried, aromatic herbs & flowers like Himalayan Chamomile, Rosemary, etc. Every single ingredient is handpicked, carefully cleaned, and mindfully manufactured to make the gentle, soothing cleanser that cleans without irritating or robbing tender skin of its acid mantle or barrier function. 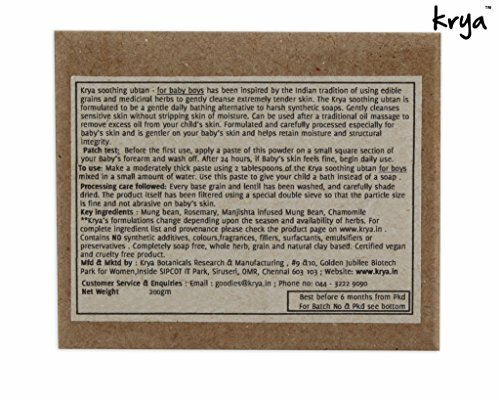 Parents LOVE Krya’s baby products for their authenticity, purity, use of WHOLE Ayurvedic herbs and grains, and for their gentle natural fragrance, ability to cleanse baby’s skin without irritating it or harming it any way. The Krya Ubtan for baby boys is made using WHOLE ingredients: whole grains, whole lentils and whole herbs. Every single ingredient comes directly from a plant and not a factory. We use no extracts, sulphates, parabens, mineral oil, phthalates, thickeners, fillers, colours, artificial fragrances or anything synthetic in our products. This makes our cleanser range the safest, gentlest and most non toxic and planet friendly choice you could make for your baby. 1. Synthetic baby soaps and body washes may look harmless, but are full of toxic synthetic chemicals and are not good for a baby’s tender, sensitive skin. Repeated use of a synthetic bodywash or baby soap dries out baby’s skin, alters its pH and leaves baby’s immune system vulnerable. 3. Parents report that regular use of this Ubtan keeps their baby’s skin from going dry, and baby remains clean, sweet smelling and fresh for much longer, compared to synthetic soaps & bodywashes. Most importantly, they appreciate the product for being PURE, NON-TOXIC and SAFE to use even for new born babies. 4. The Krya Ubtan for baby boys is made using WHOLE ingredients: whole grains, whole lentils and whole herbs. Every single ingredient comes directly from a plant and not a factory. We use no extracts, sulphates, parabens, phthalates, thickeners, fillers, colours, artificial fragrances or anything synthetic in our products. This makes our cleanser range the safest, gentlest and most non toxic and planet friendly choice you could make for your baby. 5. Your baby boy’s skin is best nourished and nurtured by using the Krya ubtan along with one of Krya’s baby oils for skin. Krya’s range of baby skin oils have been appreciated for their authenticity, formulation and process integrity followed and for their universally good and nutritional effects on skin and hair.